The Antipsychotics in Dementia (A4D) programme was launched in October 2008. Since then, the use of antipsychotics in older people has continued to increase. Non-pharmacological treatments for the behavioural and psychological symptoms of dementia should be trialled first before considering drug therapy. Antipsychotics are only indicated for aggression, agitation or psychotic symptoms that cause significant distress or risk of harm to the patient or others. What are the risks and benefits of antipsychotics for BPSD? The Antipsychotics in Dementia (A4D) programme was launched in October 2008 and included a special edition of Best Practice Journal, “Antipsychotics in Dementia”, a supporting website and a practice review activity. The focus of the programme was to provide education and guidance on the safe use of antipsychotics in the treatment of behavioural and psychological symptoms of dementia (BPSD) in aged care facilities. The following is a reminder and update of the key points of the programme along with some results and comments from the practice review. It is well recognised that antipsychotics provide relatively few clinical benefits for people with dementia and in some cases pose a serious risk of an adverse outcome. Methodological problems make it difficult to provide precise figures for the benefits and risks. A recently commissioned review for the UK National Health Service predicts that for every 100 people given an antipsychotic only 20 will derive some clinical benefit and there will be one extra death and one extra stroke.1 Antipsychotics should not be initiated without careful consideration and repeat prescribing should be limited to those who are obviously benefiting. Non-pharmacological treatment should be trialled initially, before considering drug therapy, as antipsychotics have limited clinical effectiveness for BPSD. Interventions should be tailored to the individual and the impact carefully monitored. A balance is necessary as excessive stimulation or over-activity may be counterproductive. Activities such as art, music, crafts, cooking, games and interaction with pets stimulate the person with dementia to become involved in a meaningful and enjoyable activity. Involvement in recreation may improve communication and self esteem. BPSD refers to a spectrum of quite diverse symptoms which cannot be placed under the same treatment umbrella. The important message is that antipsychotics are not effective for all BPSD. There is some evidence that typical (e.g. haloperidol) and atypical (e.g. risperidone, quetiapine) antipsychotics are effective for psychotic symptoms (e.g. delusions or hallucinations) associated with dementia, or for people who are aggressive or agitated without psychoses. An antipsychotic is only indicated if the symptoms cause severe distress or an immediate risk of harm to the patient or others. Unless immediate drug treatment is required, standard non-pharmacological measures should be tried first. A trial of drug treatment should be viewed as a short term strategy and reviewed at least every three months. Symptoms that do not usually respond to an antipsychotic include wandering, social withdrawal, shouting, pacing, touching, cognitive defects and incontinence.6 These symptoms may respond to interventions such as improvements to the environment. It is important to realise that psychotic symptoms may be present without causing concern to the person or others, and in this setting close observation and non-pharmacological management are appropriate. Haloperidol and risperidone have most commonly been used in BPSD. They do not differ significantly in clinical effectiveness for BPSD. At low doses, and in short term use, there are no appreciable differences in extrapyramidal effects, but haloperidol is associated with a greater risk of tardive dyskinesia. Haloperidol is often suitable for the short term treatment of delirium or for aggression, agitation or psychoses. For longer term treatment an atypical agent such as risperidone is preferred. However, it should be recognised that risperidone behaves like a typical antipsychotic at higher doses, with the associated increased risk of extrapyramidal effects. Olanzapine offers no clinical advantage over the other antipsychotics used for BPSD and has anticholinergic adverse effects. It is often associated with rapid and significant weight gain. It appears that quetiapine is being increasingly used in older people. However there is little evidence to support its effectiveness in BPSD and it can cause significant postural hypotension and sedation. Neither quetiapine or olanzapine have an indication in New Zealand for the treatment of symptoms associated with dementia. See here for more information about quetiapine. If a trial of antipsychotic treatment is considered necessary the starting dose should be as low as possible. This is particularly important for those people who are older, frail or at increased risk of falling. The starting dose can be divided or timed according to the behaviour, e.g. a lunchtime dose for those patients exhibiting increased agitation towards the end of the day (“sundowning”). Dose increments should be modest and occur at no less than weekly intervals depending on response. Prior to starting a treatment trial, it is advisable to document what will constitute a worthwhile clinical response, the duration of treatment and the maximum dose. Avoid high doses or prolonged use of antipsychotics that have not significantly improved the target behaviour. Recommended starting and maintenance doses are given in Table 1. Initiation of treatment with an antipsychotic should be considered only as a trial to establish whether there is a reduction in the intensity and/or frequency of target behaviours. Carers must know what key adverse effects to monitor. Ongoing dose increases only tend to worsen adverse effects. Routinely monitor for adverse effects such as constipation, sedation, postural hypotension and extrapyramidal effects. Additional monitoring may be appropriate, e.g. blood glucose and weight measurement with olanzapine. Withdrawal of antipsychotics should be done gradually, e.g. by reducing the dose by 50% every two weeks then stopping after two weeks on the minimum dose, with monitoring for recurrence of target behaviours or emergence of new ones. The longer a medication has been prescribed, the slower the withdrawal period needed. Decisions to continue antipsychotics should be documented and include expected benefits and potential risks of ongoing treatment. After receiving A4D programme material, aged care facilities were invited to complete a review of their practice. A total of 312 patients were reviewed in 36 facilities. The most frequently prescribed antipsychotics for BPSD were risperidone (37%), quetiapine (28%) and haloperidol (13%). This was a relatively small sample and the survey was not scientifically validated, but the collated responses to some of the questions suggest several areas where practices could be improved, especially in the documentation and review of antipsychotic use for BPSD. In 64% of patient notes there was no record that withdrawal of the antipsychotic had been attempted. Comment: for most patients, withdrawal of the antipsychotic should be attempted and this should be documented in the patient record. Monitoring for adverse effects was only mentioned in the patient record in 35% of cases. Comment: there should be a clear record of what adverse effects to look out for especially during initial dose titration. For about 30% of patients there was no clear record that target behaviours were identified before prescribing. Comment: target behaviours should always be identified before prescribing an antipsychotic. For 30% of patients there was no clear record of whether a response to a target behaviour had occurred. Comment: failure to monitor response may lead to unnecessarily prolonged treatment or ineffective treatment with a high risk drug. Banarjee S. The use of antipsychotic medication for people with dementia: A time for action. An independent report commissioned and funded by the Department of Health (England). October 2009. Available from: www.dh.gov.uk (Keyword Bannerjee) (Accessed January, 2010). Opie J, Rosewarne R, O’Connor DW. The efficacy of psychosocial approaches to behaviour disorders in dementia; a systematic literature review. Aust NZ J Psychiatry 1999;33:789-99. Scottish Intercollegiate Guidelines Network (SIGN). Management of patients with dementia. A national clinical guideline. SIGN, 2006. Available from: www.sign.ac.uk/pdf/sign86.pdf (Accessed January, 2010). Teri L, Logsdon RG, Uomoto J, McCurry SM. Behavioural treatment of depression in dementia patients: a controlled clinical trial. J Gerontol B Psychol Sci Soc Sci 1997;52(4):159-66. Schneider LS, Dagerman K, Insel P. Efficacy and adverse effects of atypical antipsychotics for dementia: meta-analysis of randomised, placebo-controlled trials. Am J Geriatr Psychiatry 2006;14:191-210. National Prescribing Service (NPS). The role of antipsychotics in managing BPSD. Prescribing Practice Review 37. NPS, 2007. Available from: www.nps.org.au (Accessed, January, 2010). National Institute of Clinical Excellence (NICE). Dementia Guidelines, NICE 2006. Available from: www.nice.org.uk/cg42 (accessed January, 2010). Ballard CG, Thomas A, Fossey J, et al. A 3-month, randomised, placebo-controlled, neuroleptic discontinuation study in 100 people with dementia: the neuropsychiatric inventory median cutoff is a predictor of clinical outcome. J Clin Psychiatry 2004;65:114-9. Fossey J, Ballard C, Juszczak, et al. Effect of advanced psychosocial care on antipsychotic use in nursing home residents with severe dementia. BMJ 2006;332:756-61. THE USE OF ANTIPSYCHOTICS IN OLDER PEOPLE is associated with an increased risk of falls. 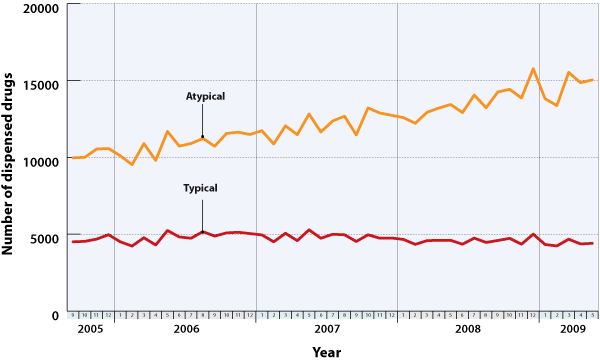 Analysis of dispensing patterns for antipsychotics (September 2005 – May 2009) in people aged over 65 years, shows that use of the typical antipsychotics such as haloperidol has remained relatively stable, whereas there has been an increase in the use of the atypical antipsychotics (Figure 1 below). Most, if not all, of this increase in atypical antipsychotic use can be attributed to increased volumes of quetiapine (Figure 2 below). 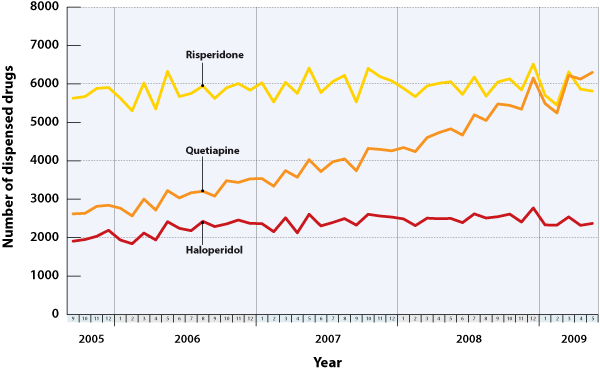 In 2005 risperidone was the most dispensed atypical antipsychotic (56% of all atypical antipsychotics) compared with quetiapine (26%). The latest data indicates that they are now approximately equal on 40%. What conclusions can be drawn from this analysis? The safety concerns about the use of antipsychotics in people with dementia have not reduced dispensing volumes in older people. This may be explained by the fact that antipsychotics, particularly quetiapine, are used in older people for indications other than BPSD. The increased volume of quetiapine may be attributed to its use as a hypnotic and sedative, in preference to a benzodiazepine. While there may be some therapeutic advantages of quetiapine over a benzodiazepine, quetiapine is not licensed for these indications and there are some safety concerns, especially postural hypotension and increased fall risk. Only prescribe for specific indications and review regularly. Avoid long-term use if possible. Start with a very low dose (e.g. 25 mg quetiapine) and titrate to effect carefully. Be vigilant for the possibility of excessive sedation and hypotension with antipsychotics, especially with quetiapine. Postural hypotension following the first dose can be sudden and profound, particularly in older people taking other hypotensive drugs and CNS depressants. Be aware of the possibility of drug interactions such as additive drowsiness and sedation with antihistamines, antidepressants and alcohol.